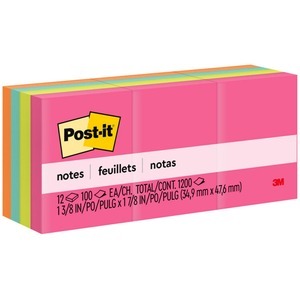 The original Post-it comes in a size that is easy to carry and always on hand. Self-stick removable notes stick securely and remove cleanly. Smaller notes are great for jotting quick messages. The Cape Town Color Collection is a vibrant pallet that is true to this port at the southern tip of Africa. Post-it Notes are recyclable, and the paper in Post-it Notes is sourced from certified, renewable and responsibly managed forests.